Hezbollah’s past operations in Iraq show that a limited number of experienced “consultants,” working with Iran’s Qods Force, could significantly increase the lethality of the local Shiite militias currently gearing up to counter the ISIS offensive. As Sunni militants from the Islamic State of Iraq and al-Sham (ISIS) captured Mosul two weeks ago and set their sights on Baghdad, Hezbollah leader Hassan Nasrallah offered to send fighters to Iraq to help turn the jihadist tide. In Syria, the Lebanese Shiite group’s forces have already deployed in large numbers over the past several years and made all the difference in the Assad regime’s battle for survival. In Iraq, Hezbollah would likely dispatch only small numbers of trainers and special operators. Yet given the group’s past special operations and training activities in Iraq and its close ties with Iran’s elite Qods Force, even a modest deployment would likely have a significant impact. On June 17, Nasrallah pledged, “We are ready to sacrifice martyrs in Iraq five times more than what we sacrificed in Syria in order to protect shrines,” noting that Iraqi holy sites “are much more important” than Shiite shrines in Syria. To be sure, Hezbollah is heavily invested in the Syria war and will probably increase its presence there as Iraqi Shiites leave to defend their homeland from ISIS. Yet the group can make a significant contribution to the Shiite counteroffensive in Iraq without having to redirect many of its operatives or resources from Syria. During the last Iraq war, Hezbollah effectively used a limited number of special operations personnel to train Iraqi Shiite militants and support sporadic special operations targeting coalition forces. As a 2009 Australian government report concluded, “Hezbollah has established an insurgent capability in Iraq, engaging in assassinations, kidnappings and bombings. The Hezbollah units have been set up with the encouragement and resources of Iran’s Revolutionary Guards al-Qods Brigades.” The Qods Force will likely request a similar initiative to aid the Shiite-led government in Baghdad today, turning these capabilities against ISIS with potentially far-reaching benefits for Iraqi Shiite militias. The most prominent example of how this training helped the militias was probably the January 20, 2007, attack on the Joint Coordination Center in Karbala, which resulted in the deaths of four American soldiers. That well-executed operation was thoroughly planned with the help of the Qods Force and Hezbollah, as determined later through the capture of one of Hezbollah’s best trainers in Iraq, Ali Musa Daqduq. Daqduq was heavily involved in training tactical units of Iraqi Shiites and even took part in some of the operations they conducted. He was also responsible for planning other operations such as the aborted kidnapping of a British soldier, and gave specific instructions to those he trained about the use of IEDs. Moreover, while operating in Iraq, he dealt directly with the Qods Force on certain occasions — further evidence of the high level of coordination between Hezbollah and the Iranians on Iraq. Besides branching out to Yemen, Unit 3800 received another boost to its capabilities and prestige in 2012, when Hajj Khalil Harb — a longtime Hezbollah commander and close advisor to Nasrallah — was appointed to lead it. Harb is an experienced operative who has held various key positions, especially in terms of working with other terrorist organizations and overseeing special operations. He served as deputy commander of Hezbollah’s central military unit in Southern Lebanon during the late 1980s, where he gained his first substantial experience in special operations against Israeli forces. He later assumed command of Unit 1800, the Hezbollah force dedicated to assisting Palestinian terrorist groups by operating in the “ring countries” around Israel and infiltrating individuals into Israeli territory to conduct terrorist attacks and collect intelligence. According to the Treasury Department, Harb also traveled to Iran many times in his role as coordinator between Hezbollah, the Palestinians, and Tehran. After his role in Yemen became apparent to U.S. intelligence, the department designated him for sanctions in August 2013, citing his long body of work. Appointing Harb to head Unit 3800 no doubt made a great deal of sense to Hezbollah’s leaders given his experience working with other terrorist organizations, his close relations with the Iranians, and his expertise in special operations and training. The unit has likely benefited from his guidance and upgraded its capabilities since then. Deploying members of this unit to Iraq would also make sense given Harb’s status as a former advisor to Nasrallah, who would presumably want an experienced commander in charge of such an important arena. As in the past, Hezbollah’s contribution does not have to include hundreds of fighters, but only a limited number of experienced trainers and special operations “consultants.” This type of contribution would not overstrain the organization, and it could facilitate far-reaching achievements for Iraqi Shiite militias. Defending Najaf, which the Takfiris have vowed to pillage, is a “hollow excuse” for involvement? What I am reading? Oh, a column by the Washington Institute for Near East Policy, a known Zionist front. I cannot count the amount of “hollow excuses” for involvement that has come out of them. From “Saddam has big, bad weapons” to justifying support for known Al-Qaeda cells in Libya and Syria in order to get rid of “big, bad dictators,” there is nothing more putrid than these neoconservative hacks. Good information nonetheless, but I would take it with a grain of salt. So if Hezbollah and the Qod force are sending in military advisers and the U.S is also sending in military advisers does that mean that all the parties will be working together to train the iraqi forces,or will the U.S only train the iraqi government forces and the militias are trained by the Hezbollah/Qods forces!!! This will be bad for Iraq in the long run. Lowering Sunnis status even more will cause a longer strife in Iraq. The point is, there should be NO ‘Militias’. Period. ‘Reservists’ are not the same as ‘Militias’. 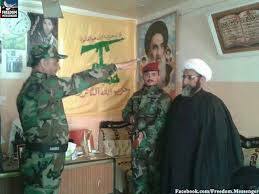 Hezbollah are turning into a guerrilla NATO for Shiites.